Herbicide resistance doesn’t happen by chance. We know a lot about how it develops and even which herbicide groups are more likely to have weeds become resistant and escape control. Dr. Hugh Beckie, research scientist with Agriculture and Agri-Food Canada developed this resistance pyramid as a way to rank herbicides by the probability of weeds developing resistance. Adapted from Beckie, H. J. 2006. Herbicide Resistant Weeds: Management Tactics and Practices. Weed Technology. Vol. 20. Issue 3. pp. 793-814. 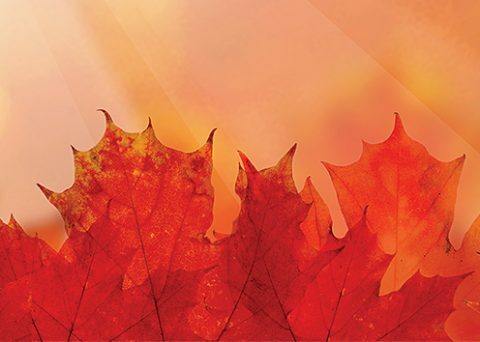 Do you know what groups you’re going to be using this season? Groups at the top of the pyramid are far more likely to have weeds develop resistance to them than groups at the bottom of the pyramid. 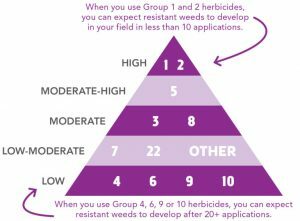 When you use Group 1 and 2 herbicides (at the top of the pyramid), you can expect resistant weeds to develop in your field in less than 10 applications. When you use Group 4, 6, 9 or 10 herbicides (at the bottom of the pyramid), you can expect resistant weeds to develop after 20+ applications. Learn more about herbicide resistance with Nufarm’s Graham Collier. Learn how to stay ahead of glyphosate resistance. “Some of the most effective ways to manage resistant weeds involve crop rotation, changing weed management practices and the use of herbicides with multiple modes of action,” says Collier.